Committed to protecting our God given rights, along with fulfilling the principles and values outlined in our party’s platform that align with those rights. Attend Brazoria, Galveston and Harris County Executive Committee Meetings. In Our District And Beyond! The countless hours of volunteering reflect her commitment to the values and principles for the conservative movement. Tanya previously stated that “I will continue to be committed to protecting our God given rights, along with fulfilling the principles and values outlined in our party’s platform that align with those rights”, during an interview with Columnist / Activist Charles Blain with Texas Scorecard. This is a goal that she strives to achieve every day. She was initially elected to the Texas State Republican Executive Committee (SREC) in 2014 and re-elected in 2016 & 2018. Before the end of the 2016 term, she served as the Chair of the Republican Party of Texas (RPT) Advancement Committee and as a Committee Member of the (RPT) Volunteerism Committee. She also assisted helping the Republican Party of Texas (RPT) Legislative Priority Committee during the Texas Legislative session, focusing on Religious Liberties. One of the goals of the Advancement Committee was to develop a resource guideline (Delegate Welcome Packet) for the 2018 Convention Process pertaining to the Precinct Convention, County / Senate District Convention and the State Convention. This resource was then added to the Republican Party of Texas Website. Tanya has hosted numerous educational trainings in Brazoria, Galveston and Harris Counties, even before she was elected to the SREC position. She organized and co-hosted the #TeamSD11 RPT State Convention Delegate Prep Summit, that was at the College of the Mainland Learning Resource Center with JT Edwards. The purpose of this Prep Summit was to spend time with other state delegates from around the senate district while learning about what to expect at the 2018 Republican Convention and to provide the necessary tools to help everyone through the convention process along with plenty of opportunities to ask questions. She served as President of the Clear Lake Tea Party for 2 terms and has served as a Board Member, since 2009. 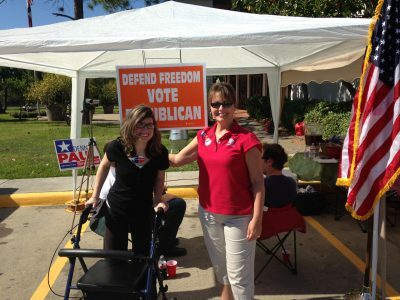 Tanya is a member of the Republican Party of Texas Grassroots Club, San Jacinto Republicans Women, an Associate Member of many other Republican Woman Clubs, helped establish the Baytown Republican Women Club and was chosen by fellow Texans as the Empower Texans Conservative Leader of 2017. Tanya worked tirelessly, with other SREC members, on a statewide effort referenced as the #RPTServes Initiative, with Republican Party of Texas Vice-Chair Amy Clark along with various elected leaders, during and after the devastation of “Hurricane Harvey”. This group of leaders coordinated with GOP Organizations across the United States to donate water, food, supplies, clothing, etc. to be delivered to centers established within the affected communities. These outstanding leaders, also located the centers arranged the deliveries and with the help of numerous volunteers, staffed the locations. She and many volunteers also worked with home owners to remove debris, deteriorated building materials and offered the necessary assistance throughout the surrounding communities. She was most recently involved in the successful Briscoe Cain for TX HD128 Campaign and currently serves as his District Director. Tanya has three (3) daughters, two (2) grand-daughters and two (2) son-in-laws. She and Mike have been married for twenty-two (22) years and are looking forward too many more years together. As your Senate District 11 State Republican Executive (SREC) Committeewoman, Tanya will continue to be the voice for our party’s principles, values, and accountability that ensure inclusiveness, along with activism, for ALL in our district.